In case you haven't noticed, Code.org offers tons of fun tutorials for wannabe coders. The newest thing is the Code.org Minecraft Designer. I decided to give it a try with my two daughters, now 7 and 5 years old. Minecraft is especially my older daughter's favorite game; she loves to create her own worlds from the simple 3D minecraft blocks. I thought that coding in the Minecraft world might inspire her. Guess what happened? Now this is a simple idea and there was nothing new really: a simple 2D world and the familiar programming blocks that are similar to the ones we've used earlierly in Scratch and other Code.org Tutorials. Yet, when I showed this to my older daughter, it totally captivated her. I had to read here the English instructions, like "The chicken is frozen. Place move and turn blocks in the when spawned slot to get it to work. I checked if there's a Finnish translation but it was very much lacking at the time. Anyway, she had a very good drive and quickly steamed through the 11 assignments, animating chickens with loops, randomness and sound, learning about events by making sheep drop wool when "used" and so on. The best part was yet to come, though! Here, for instance, the Zombies chase the player and attack when touched. The Iron Golems, on the other hand, chase the zombies. Until morning, that is. That's when it explodes! This freeform editor thing totally really hooked by daughter into designing her game and having the creatures do a lot of funny things. Chickens laying carrots instead of eggs was good fun! She also made a nicer version of here game for her little sister, who was scared of the zombies. In that version, the zombies are nice and actually a bit scared of sheep, which was a lot of fun to watch. Better yet, you can also save your work and share it as a mobile-friendly web page. Try it yourself! You can go directly to the editor here. After running your game, click the Finish button, then share the URL that's presented to you. Then you can get back to editing the game. Each time you click the Finish button, you'll get a new URL. In conclusion, this was by far the most enjoyable tutorial from Code.org so far. 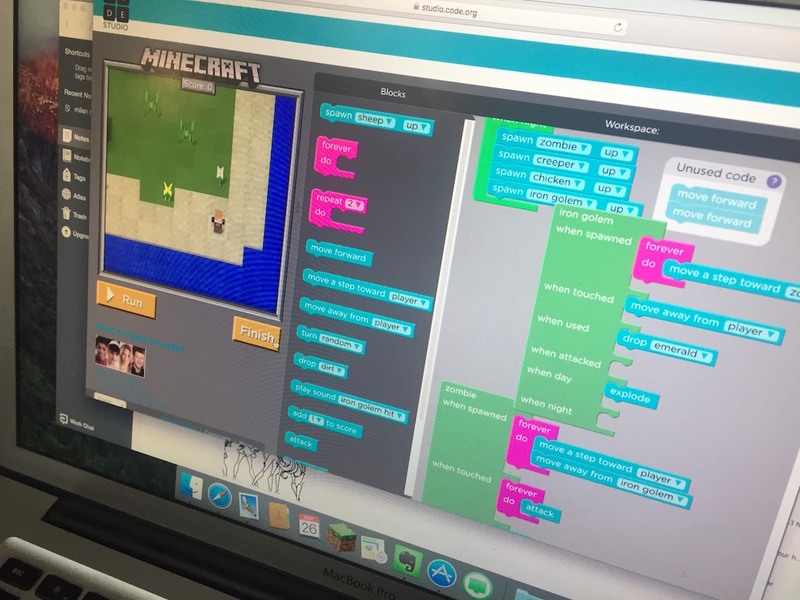 I've never seen my kids so thrilled about coding! Oh, and do you want to try (a version of) the game my daugther made? Try here. Use arrow keys to move and spacebar to attack/use. Wait until nightfall to see the zombies, creepers and iron golems. Have fun!